Wine Advocate, one of the international milestones in wine review, has awarded Ferrari bubbles with very high scores this year too, all above 92 points out of 100. The most appreciated bubbles were the Perlé Line and Giulio Ferrari Riserva del Fondatore, also in the new Rosé version, obtaining the highest scores overall, 98/100. Starting from the classical Ferrari Perlé Trentodoc, which, during the tasting, has been evaluated such as the best Traditional Method for the value-quality ratio, vintage 2012, with a score of 93/100, has been described as a bubble “opening with a light perlage with rich hints of lemon mousse, baked peach and cream pastry”. On the other hand, the features of vintage 2011 (94/100) were the fresh acidity typical of mountain Chardonnay. Nice score also for Ferrari Perlé Nero, with 96+/100 for vintage 2006, most of all for “the quality and the pleasantness in the mouth, with a fine perlage and a persisting freshness”. Vintage 2010, with 95/100 has been evaluated such as the ideal wine for culinary pairings, thanks to its elegance and structure. The tasting of Ferrari Perlé Rosé for vintages 2001 and 2012, has obtained respectively 93/100 and 94/100 and it was considered as a full-body bubble, keeping a nice softness also after a long ageing. Nice score also for Perlé Zero Cuvée Zero 11, which has obtained 94/100 for its finesse and elegance. Very high score also for Giulio Ferrari Riserva del Fondatore, with 95+/100 for vintage 1992 and disgorging 2014. This wine proves once again to win the challenge of time, keeping a soft intensity and an amazing perlage considering the long ageing. Vintage 2007 (97/100) has been defined as “pure expression of mountain Chardonnay”. The real “champion” of the charts is Giulio Ferrari Riserva del Fondatore Rosé 2006, the new born in Ferrari family, with 98 scores. It “takes Italy very close to the best Maisons de Champagne, this is a bubble revolutionising the Italian Traditional Method”. 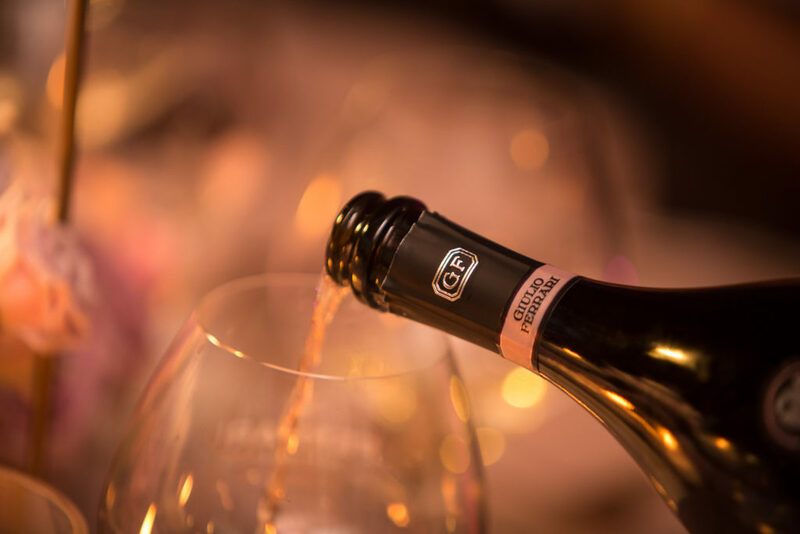 This is a very gratifying evaluation that crowns “Giulio Rosé” a new icon in Italian bubbles, and obtains the highest score ever in Italian bubbles.